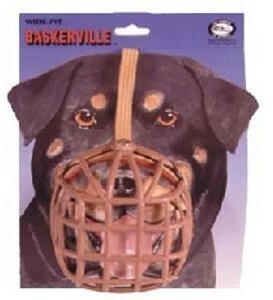 Details: BASKERVILLE MUZZLE GIVES ALL-ROUND PROTECTION Humane, comfortable, safe Permits panting and drinking Made from soft plastic mesh Lightweight and washable 13 Sizes: for toy to giant breeds including 2 wide-fit sizes for Boxer/Rottweiler types and flexible Ultra for long-nosed breeds BASKERVILLE MUZZLE Not all dogs are angels! Some are not reliable in the company of other dogs, others try to eat postmen, and some may vacuum up unmentionable things in the park! Safety must be our primary concern but not at the expense of our dog's welfare. The lightweight, basket design of the Baskerville gives all-round protection but still allows unrestricted panting and drinking. Your dog feels comfortable and you have the security of being able to decide just what should go in his mouth! Baskerville Muzzle's are designed for the dog who's not perfect all the time. Humane, comfortable, safe. Permits panting and drinking. Made from soft plastic mesh. The lightweight, basket design of the Baskerville muzzle gives all round protection but still allows unrestricted panting and drinking. Your dog feels comfortable and you have the security of being able to decide what should go in his mouth! It is lightweight and washable.